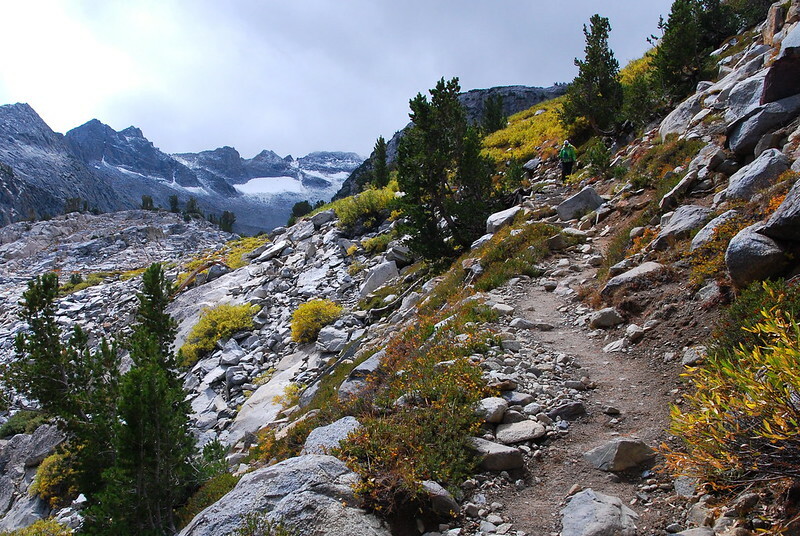 JMT, Day 22: We Did It. – Hi, Alpine. It rains off and on all night, sometimes loudly pounding against the tent, sometimes swirling so softly that it could be the wind. We wake up around six to snow. It’s not sticking, but there’s ice on the outsides of our bear barrels. And it’s cold. If the last couple days have felt like fall, this feels like winter. 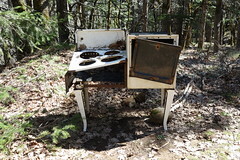 I hide under the trees of our little kitchen one last time, and make us a quick breakfast. Our last. 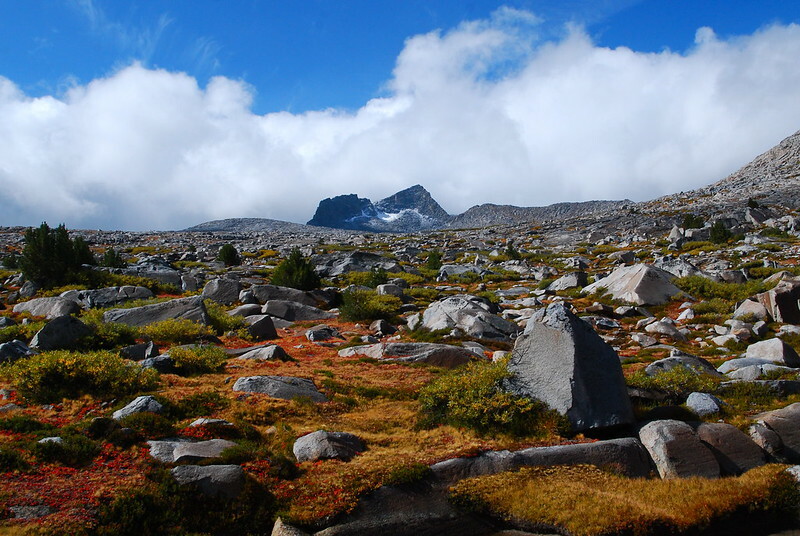 We throw the last little bits of our food in our bear barrels, put on all our rain gear, roll up our soaking tent, and begin picking our way up toward Donahue Pass – the beginning of Yosemite. 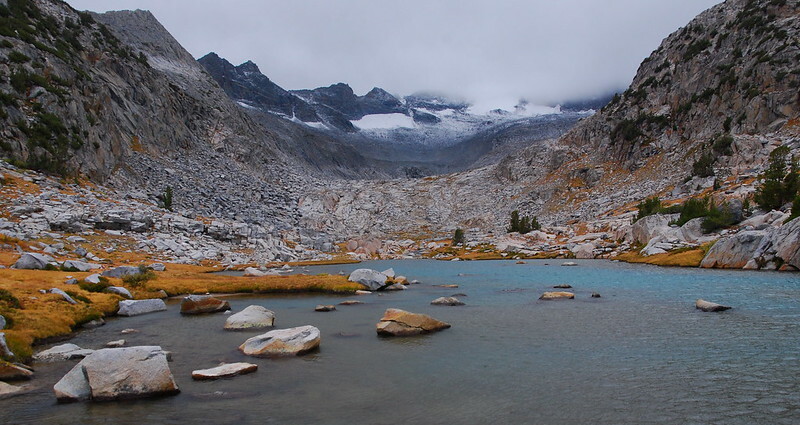 It rains off and on as we near the pass, and even seems for a moment like it’s going to let up – there’s a pocket of bright blue right above us – but then it shifts to something between hail and snow. Whatever though. I always feel invincible on the last day. 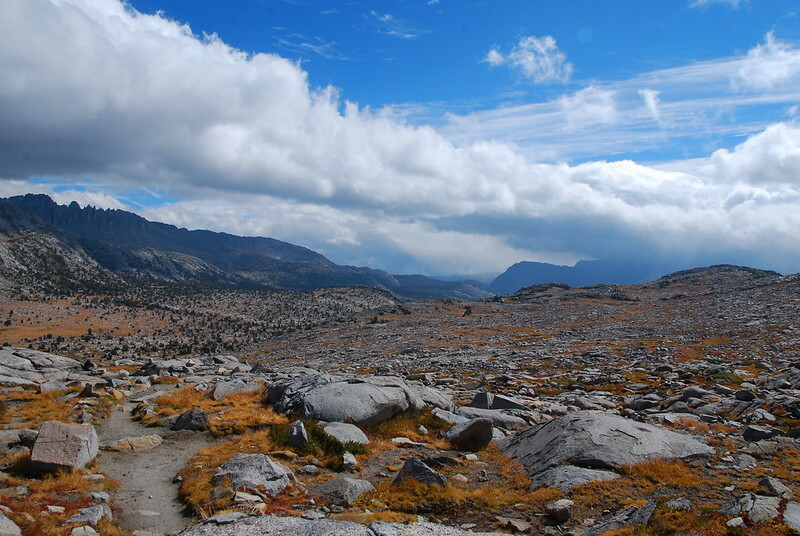 The area between Island and Donahue Passes is the only part of the JMT on the east side of the Sierra crest. Even in rough weather, it makes for nice views. Really, the whole area’s just gorgeous. Fun to see it turning autumnal. Or maybe wintry? 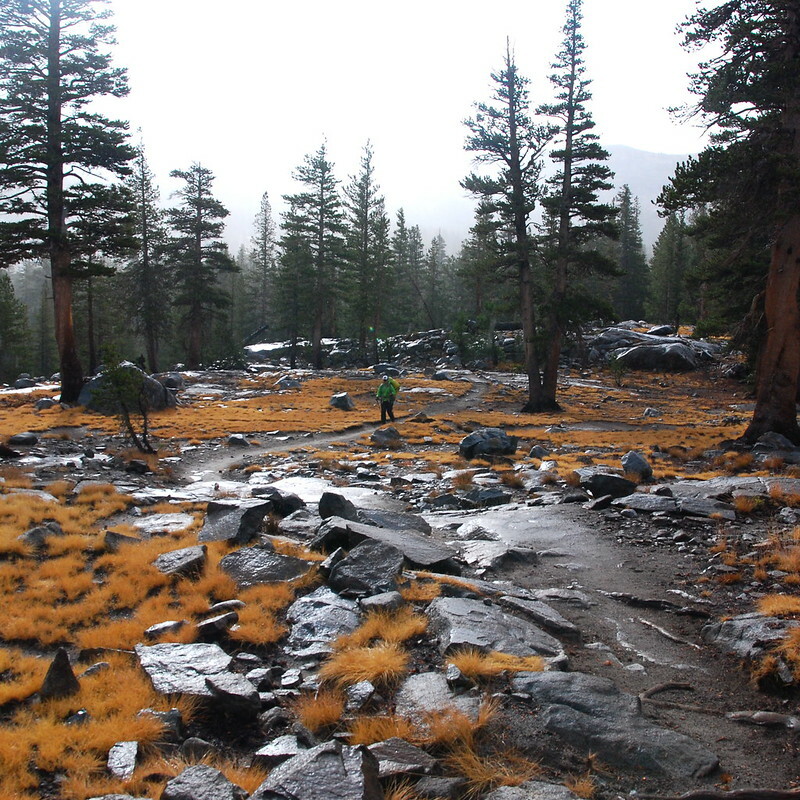 And precipitation somehow always seems less threatening when it’s the last day on the trail. Everything does. 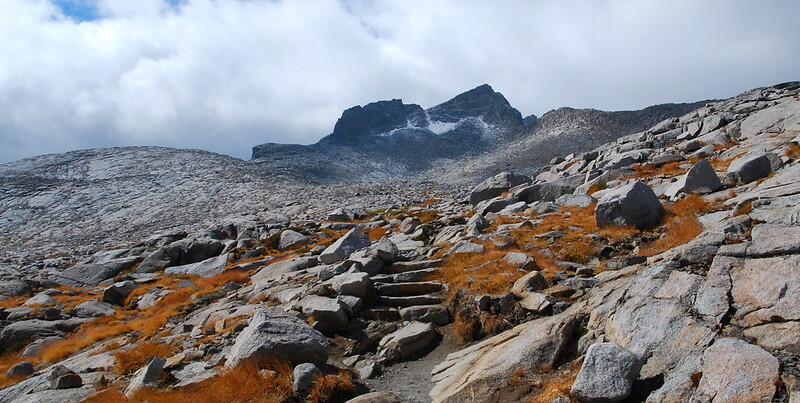 The last mile before the pass is mostly stone steps build into massive granite fields. The pikas are out to say goodbye. 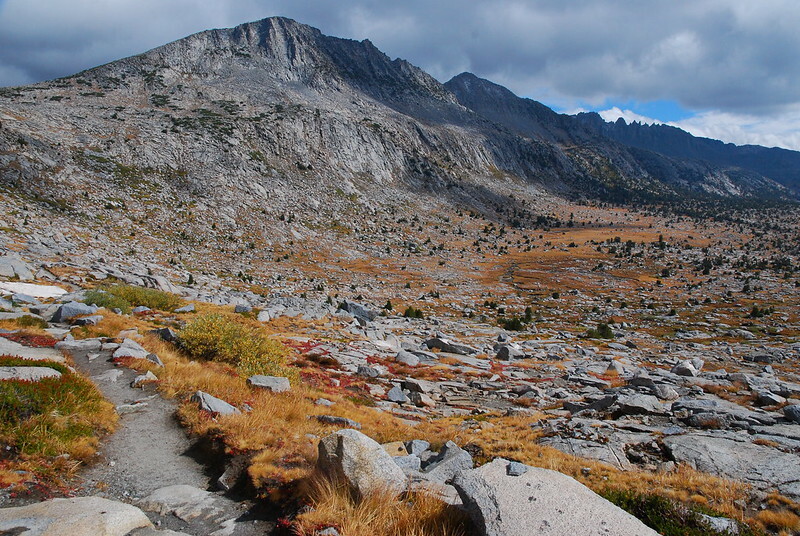 We crest the pass a little after ten, and are treated to views of our final stretch: Lyell Canyon down to Tuolumne. 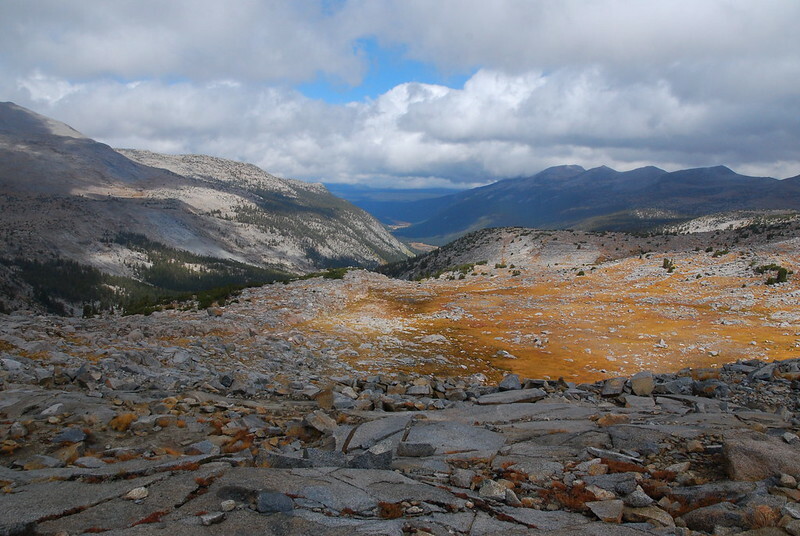 The top of the pass is crowded from weekenders out of Yosemite. A middle aged white guy in jeans warns me that the weather was bad yesterday, and that it might turn bad today as well. “You never know up here.” I thank him for the insight. What would we do without old white guys to tell us how to live? 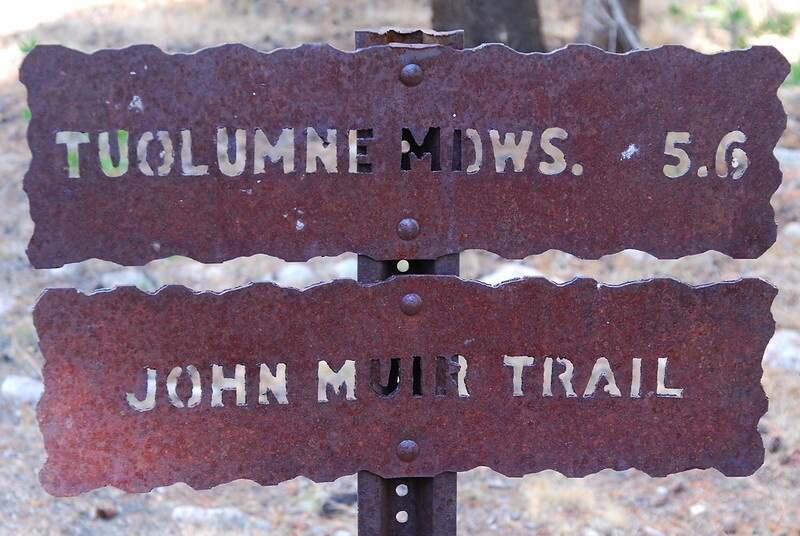 They do serve a sort of navigational purpose, though: they’re a sure sign we’re nearing a major trailhead, like birds leading ocean ships to port. 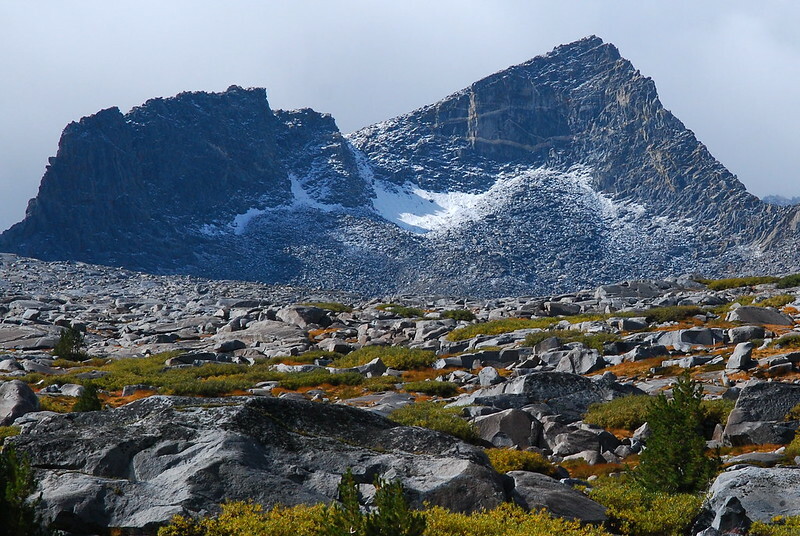 Descending into Lyell Canyon, the air feels crisp and cold, and my mind turns to the convivial pleasures of warm drinks and indoor temperature control, pumpkin patches and pies, long-simmering soups. Home. 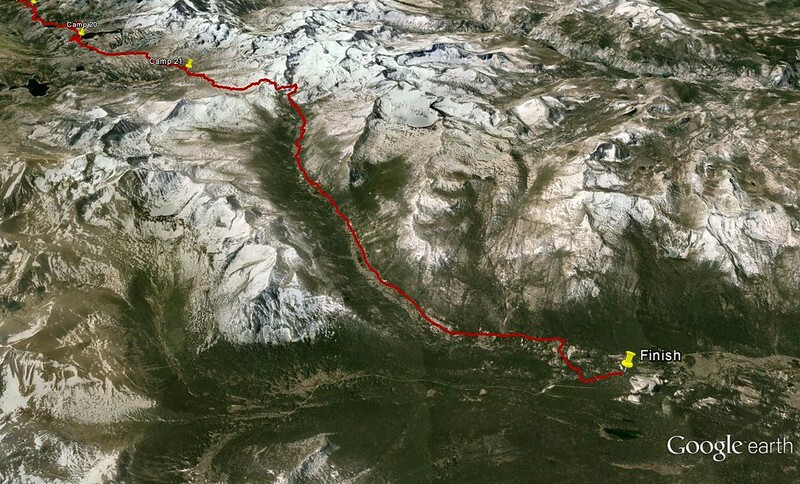 Lyell Canyon is… long. Maybe 13 or 14 miles? 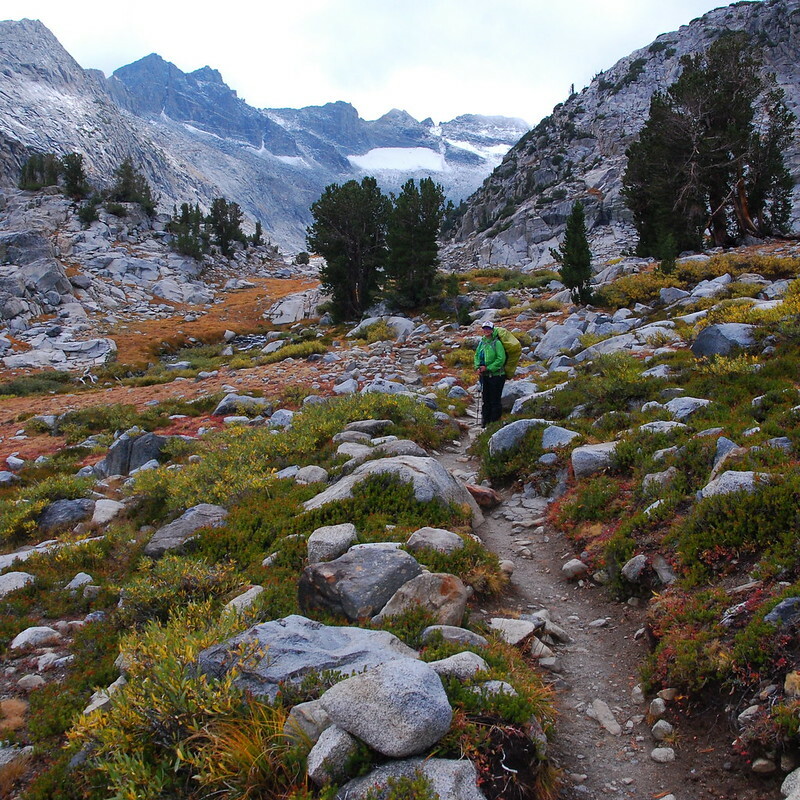 For a lot of southbounders, it’s their introduction to the High Sierra. Sort of magic. But we’re just ready to be home. We have a small snack at the beginning of the canyon, then motor on for a few hours. For the first time in a while, the trail just feels like it’s dragging. Like those old cartoons where the scenery repeats as a character runs forward. We stop again maybe halfway down for a quick lunch aside a slow, deep part of the river. The meadows are golden and it feels like we’ve spent an entire summer up here. 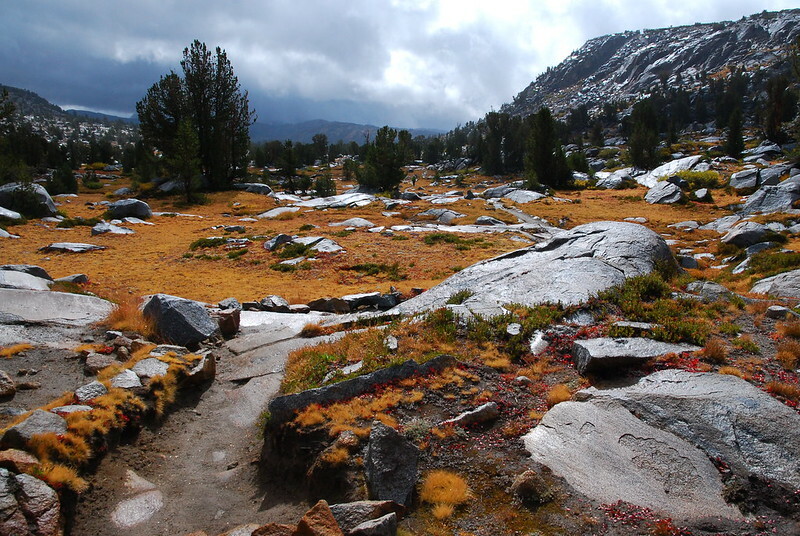 My first summer in the Sierra. Just after lunch, we hit a sign – 5.6 miles left to go. I put away the camera, and we just cruise. In a weird way, it feels like the whole trip has been leading up to this – basically jogging back to the car. I stop once, after maybe three miles. Krista’s right behind me, and has been out of water since just after lunch. Apparently her hose has been leaking? She stoically takes a few sips of mine, and says we should move on. We decide to stay close together for the last few miles, no headphones or anything. 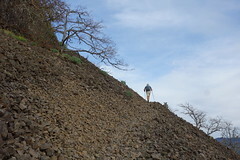 Soon the trail becomes so wide that we can walk side by side, and suddenly we’re just out for a dayhike, walking back to our car after a short few mile jaunt to some heavily visited viewpoint. Suddenly the last few weeks are in past tense. 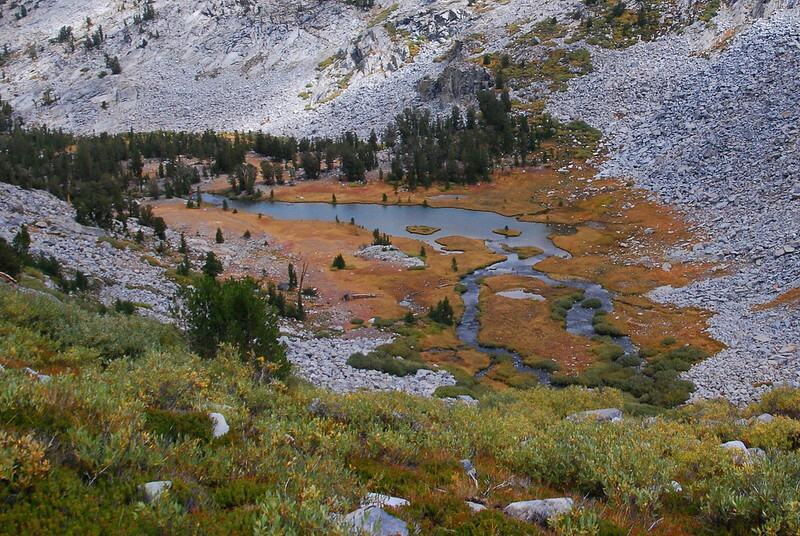 As we near Tuolumne, there are more and more people. Couples in jeans carrying small water bottles or hot coffees in disposable cups. Dogs on leashes. They’re all so clean! There’s a tangle of trails, and of course I get us sort of lost. We end up at the housing for summer employees – a bunch of RVs and tents in an open meadow. 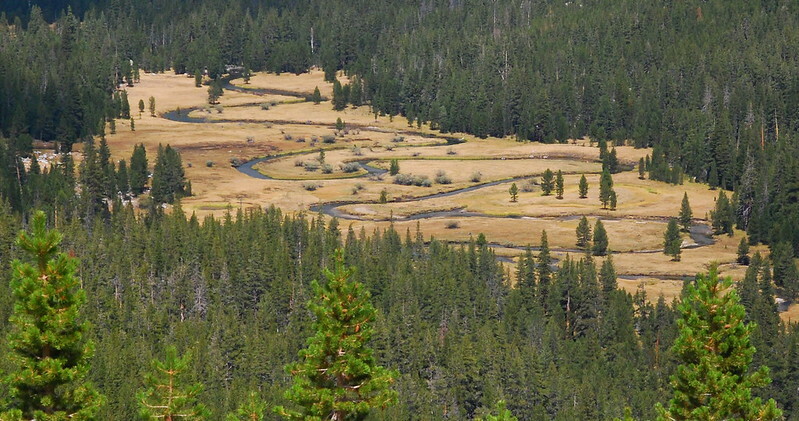 We follow the road past a massive, expensive looking lodge, then some horse stables, then finally, in the distance, the wilderness permit station and our car. It’s still here! We’re back at the car and it’s here untouched and I’m sitting in the trunk in disblelief. There’s clean water here too – a faucet near the building – where I filled up my water a month ago before we left, and where I now fill up the Nalgene that’s been waiting under the passenger seat. I drink a liter then fill up again. It’ll be months before I take water this easy for granted. Krista goes to the bathroom and comes back in her street clothes, but I decide not to change – I want to save the only clean things I have for tomorrow. I get into the driver’s seat and we sit there for a while, feeling the car’s electric heat and the unbelievable pleasure of seats made for bodies like ours. 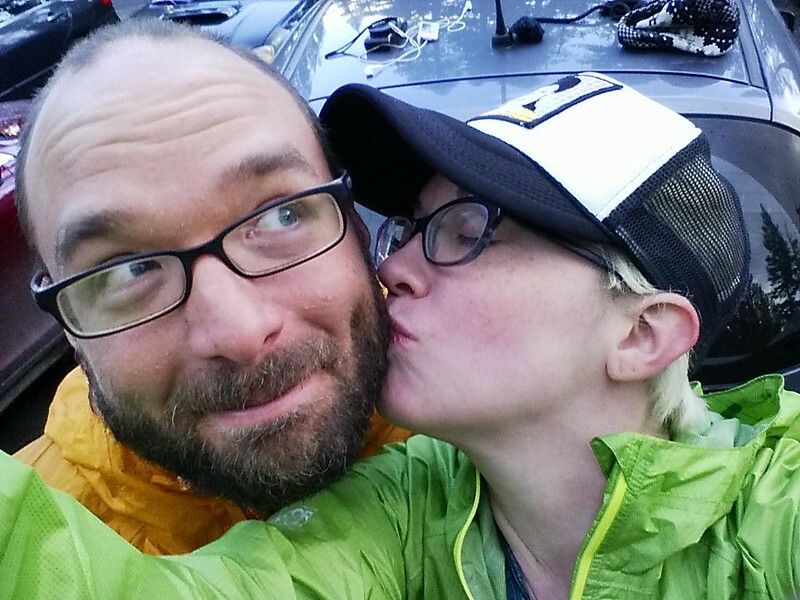 I kiss Krista on the cheek and just keep saying, over and over: we did it. I know you wrote this a couple years ago and been 3 years since you completed this but it was all new to me. I didn’t want your adventure to end. 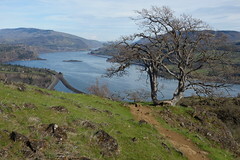 I’ve read a few blogs about this trail and yours was so well written and so poetic. The photos were magnificent. I live so close to the AT and yet this is the trail I dream about doing. I so enjoyed this whole trip (through your writing). Oh wow, thanks so much for reading! I hope you get out there someday: we live in the Pacific Northwest, and are surrounded by an embarrassment of mountains, but the Sierra is still unlike I’ve ever seen. One day I hope to! 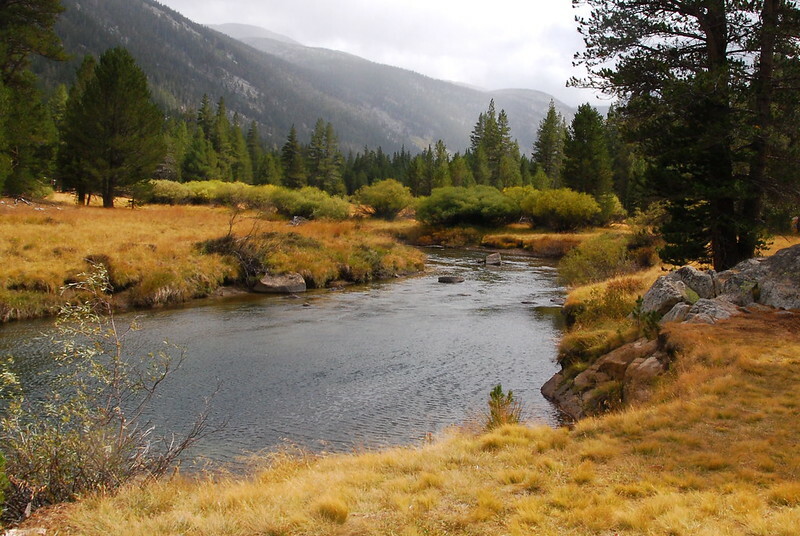 I have Shenandoah here but there’s something about Muir Wilderness….